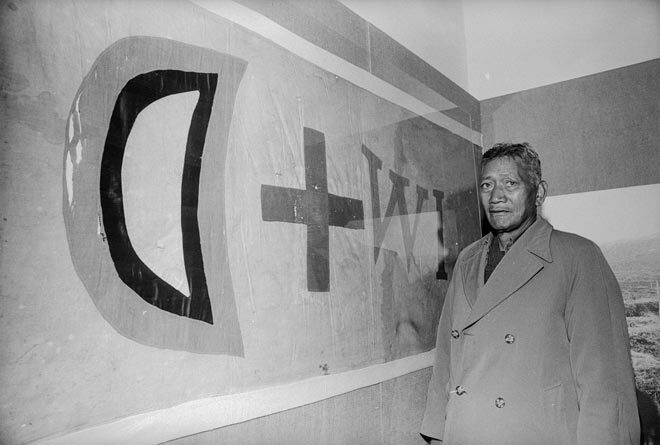 Hemi Te Poono of Te Teko stands by a Ringatū flag captured from Te Kooti by government forces during the battle of Te Pōrere in October 1869. One interpretation is that the letters 'WI' stood for the holy spirit (Wairua Tapu). The crescent moon was a tohu (portent) of a new world, and the red cross is the fighting cross of the Archangel Michael. The moon and cross reiterate the first two elements of Te Wepu, the flag of Ngāti Kahungunu which Te Kooti captured in 1868. Te Kooti probably took these images and incorporated them into a flag of his own design.